Open. Opens the project file normally; that is, in Read-Write mode. This mode is selected by default when you simply click the Open button (rather than the Open arrow). Open Read-Only. Opens the project in Read-Only mode. You can view the project, but you can't save it. To save any changes you make to a Read-Only project file, you need to save the file with a different name by using the File, Save As command. Open As Copy. Opens a copy of the project file you selected. "Copy (1) of" is added in front of the filename. If you open a second copy, it will be named "Copy (2) of," and so forth. Any changes you make appear only in the copy of the file, not in the original file. To open an enterprise project file, you must open the project from Project Server. Opening an enterprise project is also referred to as checking out the file, which prevents anyone else from changing the file while you are working on it. However, others can still view the read-only file. 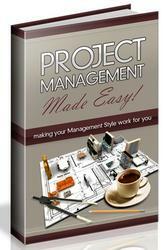 Note This section applies only if you're working with Project Professional 2003 set up for an enterprise environment. Enter your user ID and password, if prompted, and then click OK. The Open From Microsoft Project Server dialog box appears (see Figure 29-2). Make sure the Read/Write To Check Out option is selected. Figure 29-2. 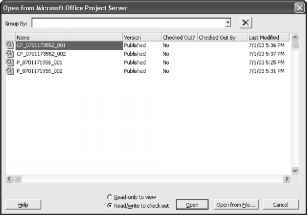 The Open From Microsoft Project Server dialog box shows the projects stored on Project Server that you are authorized to check out or view. The project file opens in Microsoft Project. If you want to work with the project while not connected to Project Server, click File, Save Offline and then specify the location where you want to save the project. If there are other users with accounts on the same server, they cannot edit the file until you click File, Save Online (which saves it to Project Server). 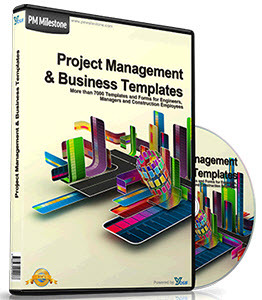 For more information about working with enterprise projects, see "Creating a New Enterprise Project" on page 645.